Dinosaur Comics - October 8th, 2008 - awesome fun times! –This is because I'm violating the understood limits of our friendship! October 8th, 2008: I was looking at the qwantzparty and haylookit Dinosaur Comics Flickr pools and there's some awesome stuff there. Cakes! Hilariously juvenile graffiti! Good work, everyone. Also I'm way way behind on replying to email so if you've written me, I've read it, but I haven't written back yet! 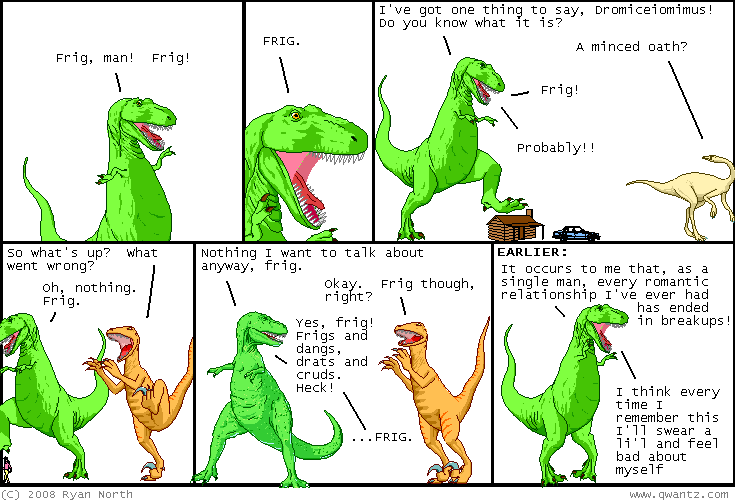 One year ago today: dinosaur comics by ryan the talking human.